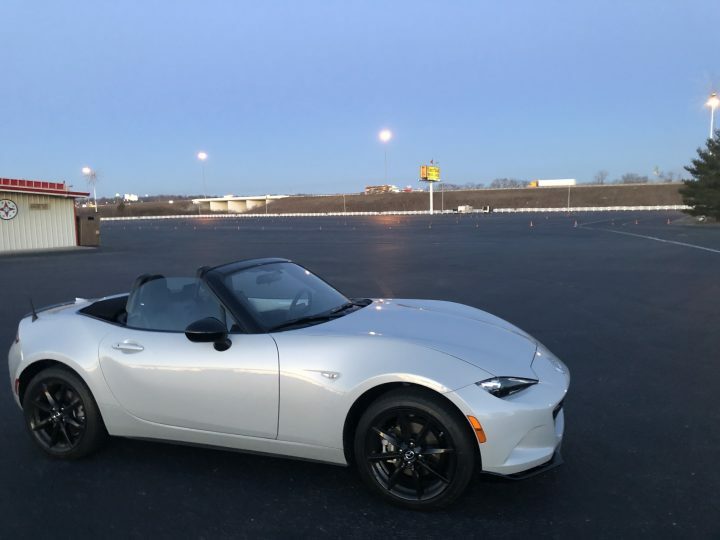 Successfully passed 600 miles, gradually increasing my imaginary redline to breaking in Tofu, my new 2019 Miata. Which means…… Time to test on an autocross course! It’s been less than 2 weeks, just 600miles on the car, and still on temporary tag! The course had 3 not too hateful hairpins (two left and one right), one right hand 90, and one left 90 degree sweeper into barely third gear drag racing finish. So here’s a few thoughts. It is very soft. There is a lot of bodyroll. Combining soft suspension with long stroke, I needed to adjust my turn in to much much earlier than my NB, which I already turn in sooner than some other cars. Maybe due to a soft bumpstop, I didn’t have very positive feel of when the suspension travel transit from the spring to the bumpstop. In one way to describe would be mushy. However even in middle of weight transition, Tofu stayed controllable and very forgiving. At first, I brake deep and light like I do in NB, and it didn’t work out well. Car pushed a little and I was fighting. However by turning in almost too early buy me time for suspension to settle and I could power out the corner nicely. The tight 90 was right after a high speed offset gate, and also over a small bump. Soft well stroking suspension has well absorbing the bump and kept the tires on ground. To my surprise, Tofu came with a set of summer tires. Potenza S-001. I was a bit too optimistic. Tires didn’t have much grip. Under heavy braking, ABS easily kicks in and I couldn’t slow down. Compensated with early braking and that helps as well as works with early turn in due to suspension, but bit frustrating. I’m so much used to dive in with late light brakingto get the car turn, but instead of the front tires biting, it just slide. Wasn’t a big fan of the pads neither. It has a topical daily drive pads’ initial bite (or lack there of), and instead of progressively bite harder, it get mushy around the mid to end of brake pedal. Yes! There are more power. Unfortunately power can only be transformed into speed when there are tires to do the job! I didn’t quite feel the torque dip that I was hearing about around 2-3k RPM. I felt like now I can pull out of tight turn without banging on steering wheel cursing at the tachometer. It really need some prep so that I can drive and feel strong. Around the corner and wiggling through the offset gate felt slower than the NB. But it pulls me right out as my tires finally get some grip. There are Koni shocks, Karcept Front Sway Bar, RS Factory Stage S500 Brake Pads, CE28CR 16” wheels, and Roadster race exhaust coming my way, and currently planning on 215-45-16 BFG Rival S 1.5 for the tires. Our regular local events won’t have much of high speed sections that need 3rd gear, and with 7500RPM Redline, I think the shorter tires would just do fine. The slow turn in can be fixed with shocks and sway bar and brake pads and better tires definitely take care of other issues. Once those are sorted out, Tofu will be an amazing car!